Hiring is expensive business. First, there are the basic job posting and employer branding costs to attract candidates. Then there are manpower costs associated with the time it takes to review resumes and interview prospects. Training new employees, which can include travel, is also a high-cost effort, both monetarily and in the human capital investment made by those performing the training. If you’re moving forward with a candidate sourced in collaboration with a staffing firm, add those fees to the growing list. Once you decide to terminate the employee, you may have unemployment costs to tack on as well. There is no doubt the cost of a bad hire can have lasting financial impact on an organization. 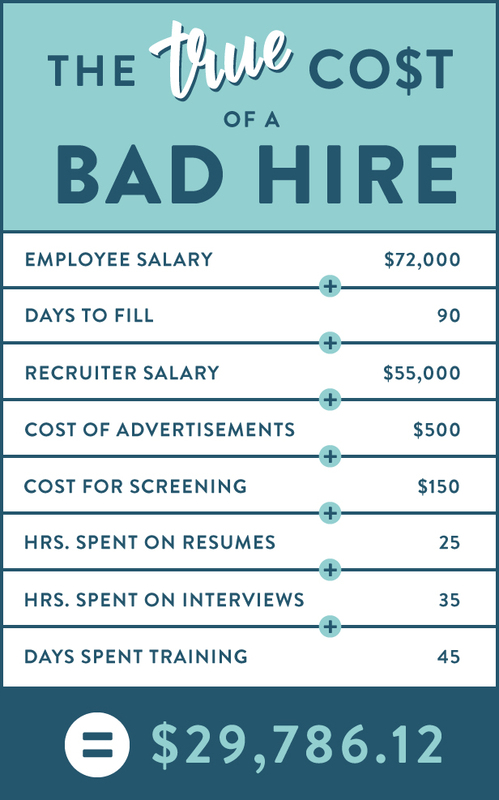 The cost of a bad hire in terms of productivity happens in a few ways. Should you hire someone who simply doesn’t have the level of skill needed to be effective in the role, productivity naturally suffers. But it has a ripple effect. Other people in the department may be slowed as well if their work is dependent on the productivity of others. Additionally, team members may need to jump in to help as a result which can also cause their own production to decrease. Once the employee is let go, productivity in that role may cease altogether until a suitable replacement is found. Again, this could cause added strain on the productivity of others in the department. While the financial cost of a bad hire can be critical, perhaps the most detrimental cost comes down to employee morale. One bad apple can indeed spoil the barrel. A bad hire can turn a once harmonious team into a group of distrusting foes. Your employees are your biggest asset. You can recoup financial losses, but recouping trust amongst colleagues is a much more difficult task. Not only that but if this downturn in morale causes turnover, replacing valued employees may take years. I’ve seen one bad hire change the culture of an entire team and precipitate an exodus that took the company years to recover from. Turnover costs are twofold. They have the monetary costs associated with hiring and training a new employee, but when good people leave, it can cause even your most loyal employees to reevaluate the status quo. Turnover raises uneasiness at all levels of an organization and how that uneasiness is handled can impact whether or not more turnover is to come. Inextricably linked to morale, the turnover creates a vicious cycle that can be very hard to break. Avoiding a bad hire is of course the first line of defense and the best way to mitigate risk. But having a clear plan in place to identify a bad hire is perhaps even more important. On a tactical level, it’s important to set clear goals and outcomes for new hires. Of course, making sure to track progress will also be crucial. But checking in with team members to make sure that morale is in tact is equally important. Part of being an effective manager is to encourage and welcome honest feedback. Open dialogue can lead to great insights while making sure that everyone maintains a feeling of being valued. Bringing the latest news in compliance, staffing, hiring trends and recruitment technologies right to your inbox. Is Your Hiring Process Making You Lose Great Candidates?